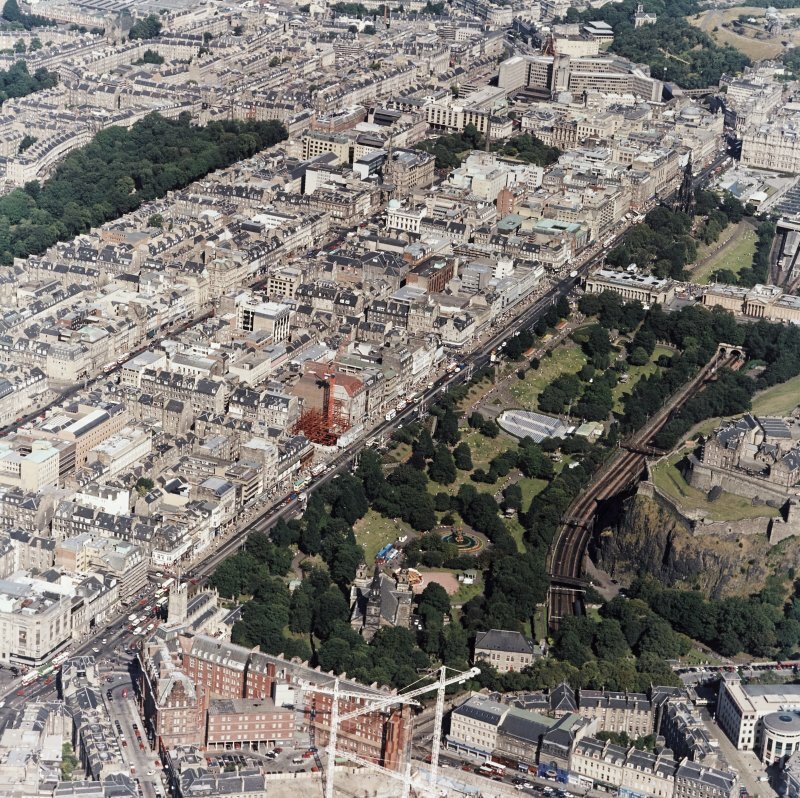 Oblique aerial view, taken from the SW, showing the New Town in the centre of the photograph, and centred on Princes Street and Princes Street Gardens. 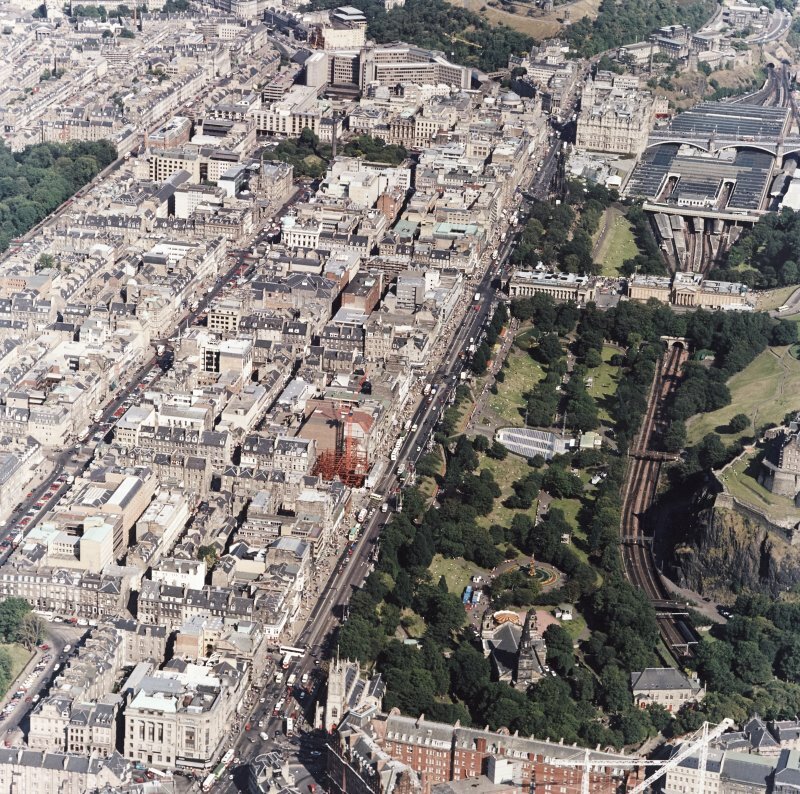 Oblique aerial view, taken from the WSW, showing the New Town on the left-hand side, and Princes Street Gardens and Waverly station on the right-hand side. 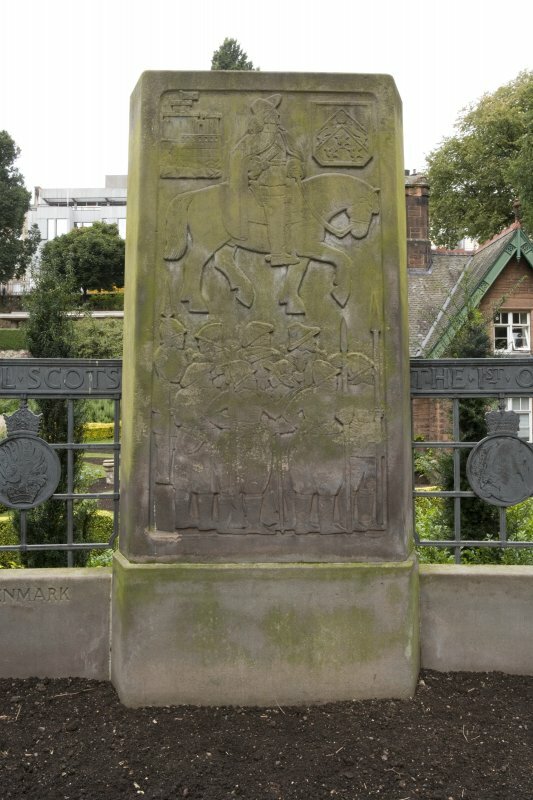 View of part of Royal Scots Memorial, showing main inscription plaque with regimental badge, and three carved monoliths. General view from west north west. Architect: Sir F Mears, 44 Queen Street. 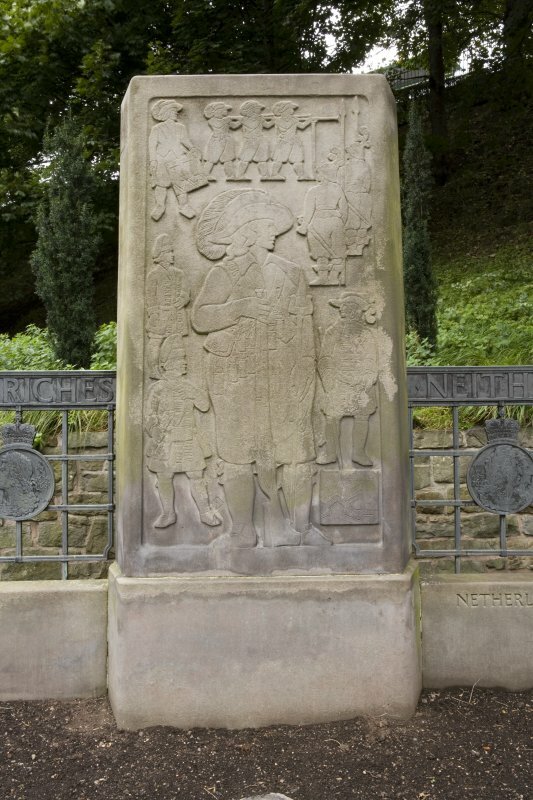 The Public Monuments and Sculpture Association (http://www.pmsa.org.uk/) set up a National Recording Project in 1997 with the aim of making a survey of public monuments and sculpture in Britain ranging from medieval monuments to the most contemporary works. 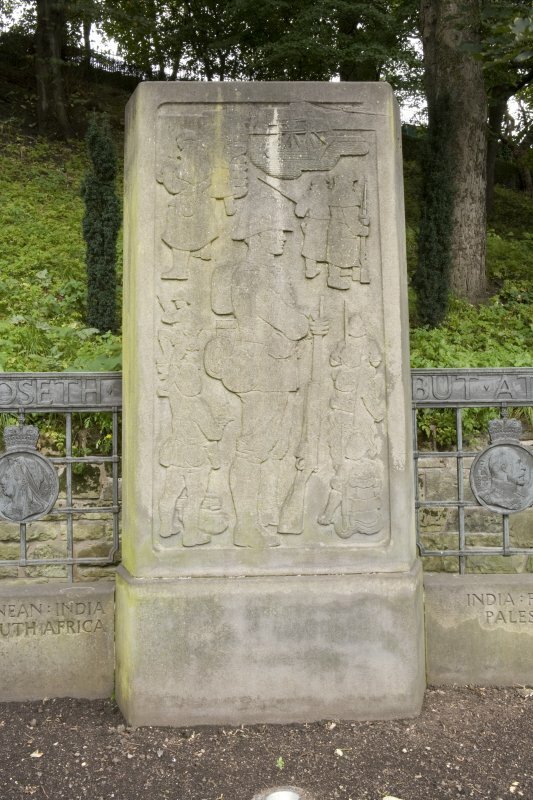 Information from the Edinburgh project was added to the RCAHMS database in October 2010 and again in 2012. The PMSA (Public Monuments and Sculpture Association) Edinburgh Sculpture Project has been supported by Eastern Photocolour, Edinburgh College of Art, the Edinburgh World Heritage Trust, Historic Scotland, the Hope Scott Trust, The Old Edinburgh Club, the Pilgrim Trust, the RCAHMS, and the Scottish Archive Network. 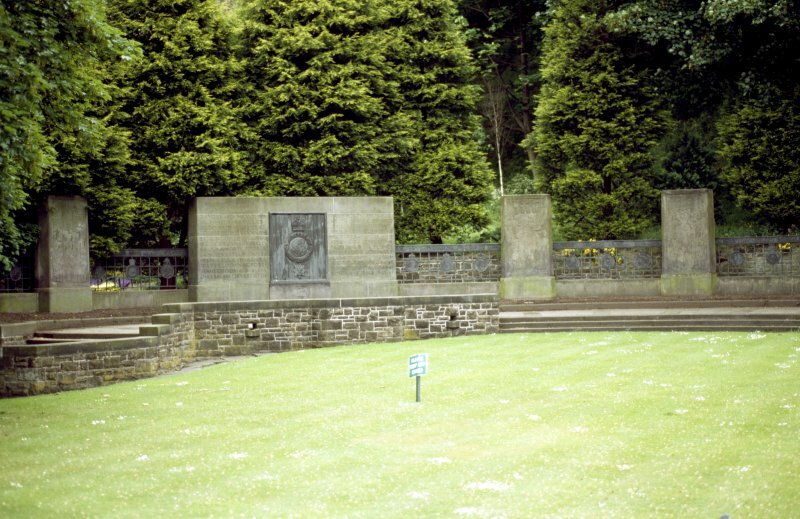 A paved semi-circular terrace featuring a massive pylon of rose-coloured freestone bearing the badge of the regiment flanked by the battle honours. 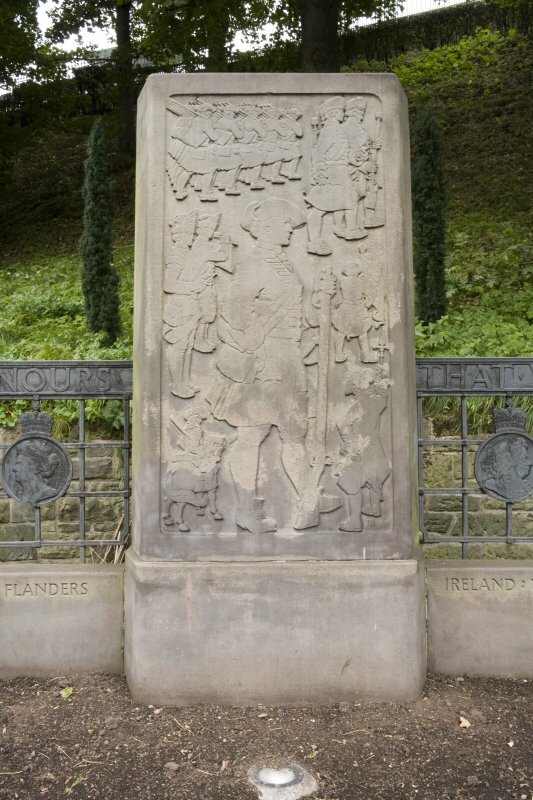 To the left of this pylon is a monolith, carved by Elizabeth Dempster, commemorating the founding of the regiment by Sir John Hepburn in 1633. 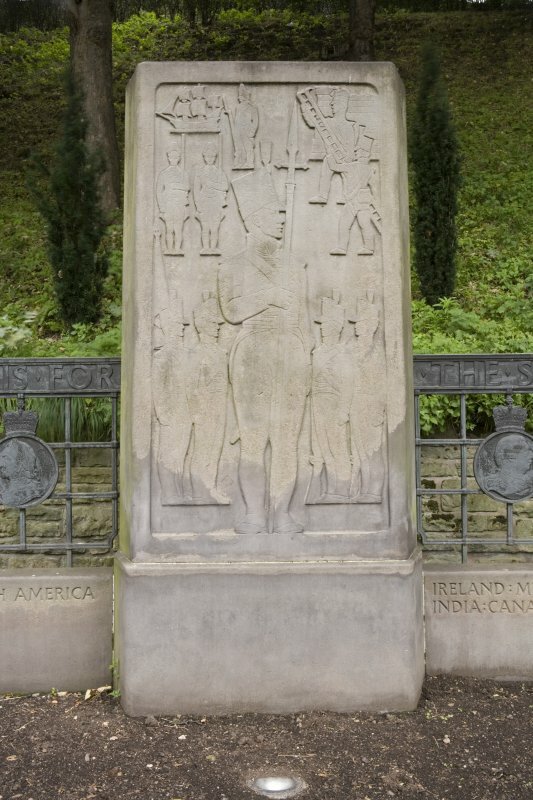 To the right are six monoliths, carved in relief, depicting changes in the dress, arms and other attributes of the regiment throughout its history. 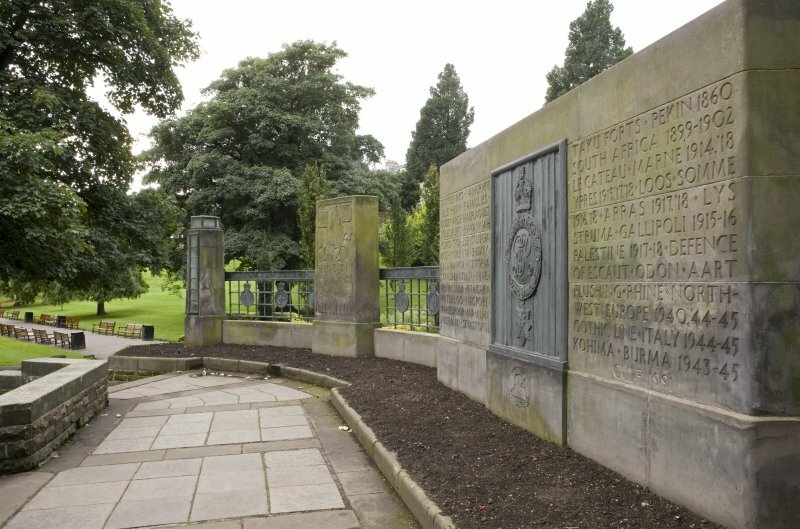 The monoliths are joined by railings decorated with medallion portraits of all the kings and queens reigning from the regiment's founding till the erection of the monument. 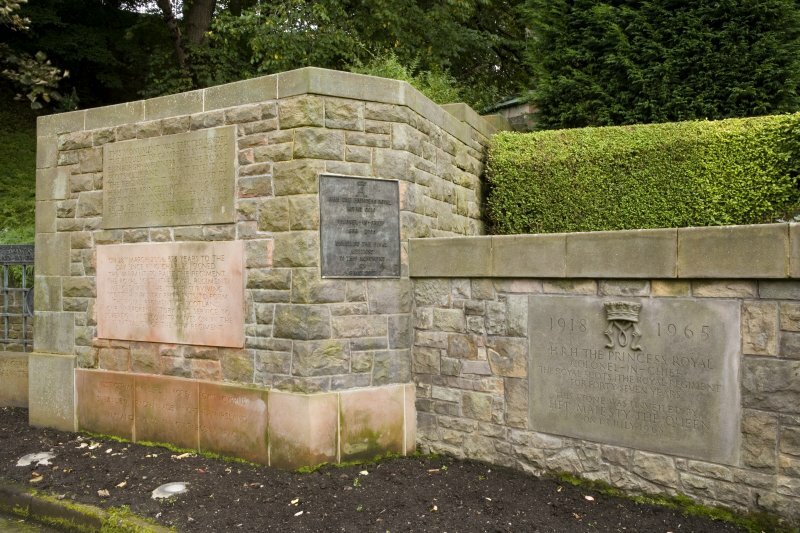 The railings are also inscribed with a quotation from the Declaration of Arbroath and, below, a low wall is inscribed with the names of various campaigns fought by the regiment throughout the world. 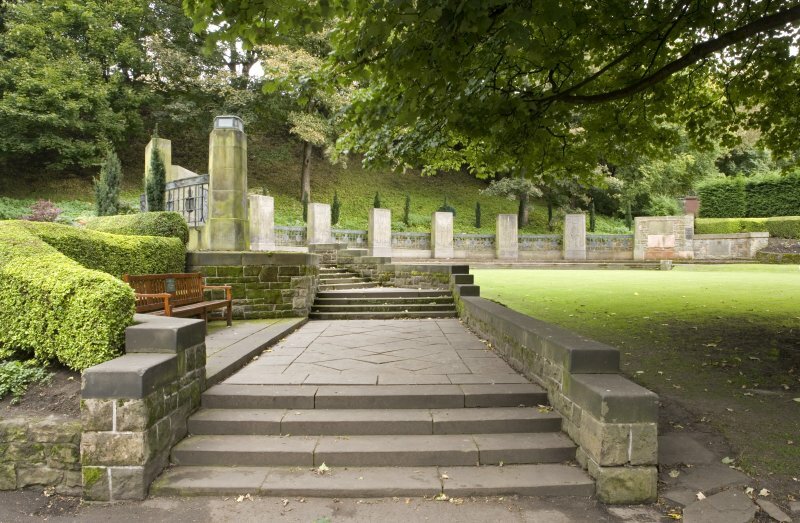 The large pylon, which is eighteen feet long and ten feet high, faces across the valley of Princes Street Gardens to the Shrine at the top of Edinburgh Castle. The monument, which depicts the living history of the regiment, is thus looking up to the Shrine which commemorates the great sacrifices made. The monument was designed by Sir Frank Mears. 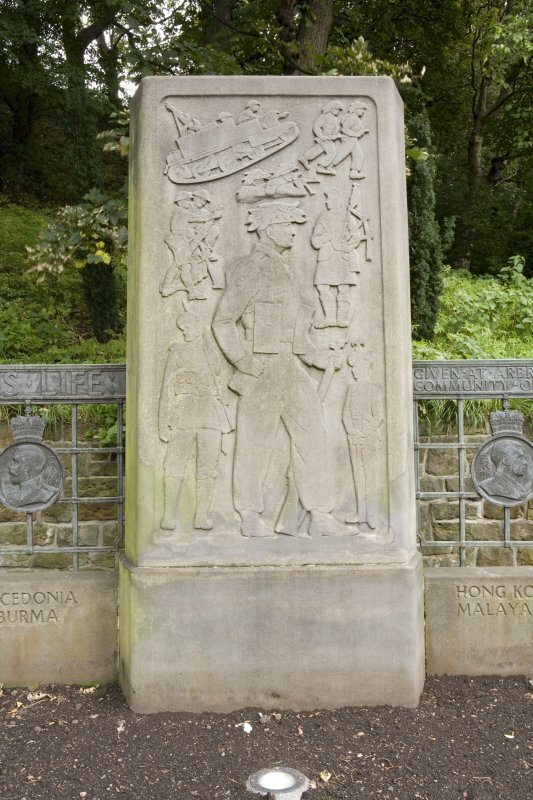 The bronze grille work was by Pilkington Jackson, and the bronze regimental badge was by James Clark. 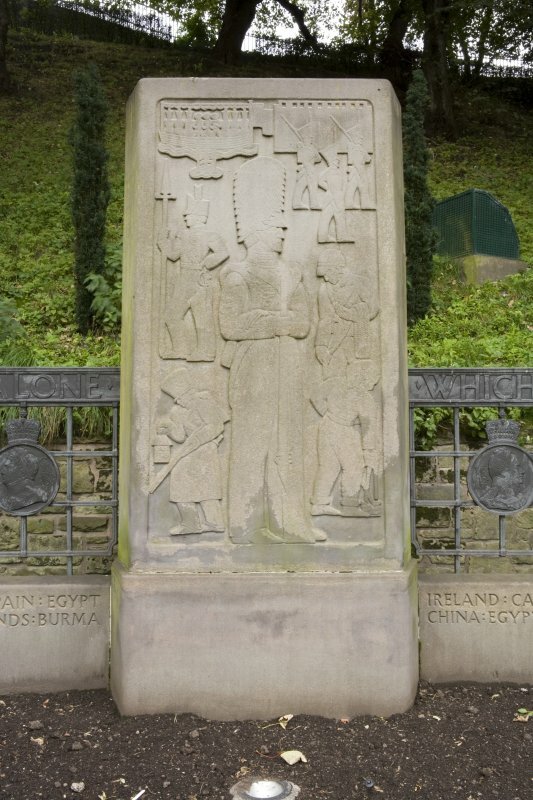 The stones were carved in situ by Elizabeth Dempster (first and fifth monoliths), Andrew Dods (second and fourth monoliths), Tom Macnair (third and sixth monliths), and Pilkington Jackson (seventh monolith and the lettering). Mr A. E. Haswell Miller, M.C., R.S.W. was consulted on historical dress and equipment depicted on the monoliths. 1) Corn stook entwined with ribbons. 2) Fleur de lis and motto MONTJOYE . SAINT . DENIS [an ancient war cry of the French Kings]. 3) Peacock feathers and crown. All the royal portrait medallions are surmounted by a crown, the portrait of Cromwell is surmounted by a helmet. 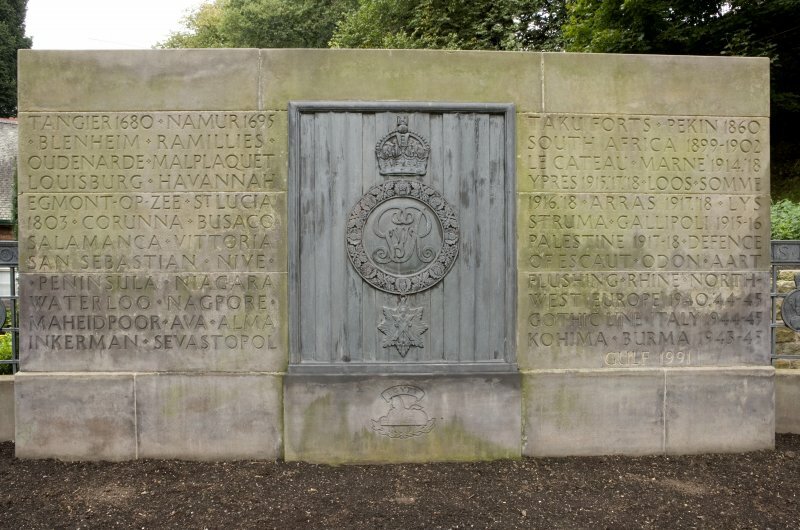 Below this is a stone plaque inscribed: ON 28TH MARCH 2006, 373 YEARS TO THE / DAY SINCE KING CHARLES I SIGNED / THE WARRANT TO RAISE THE REGIMENT, / THE ROYAL SCOTS (THE ROYAL REGIMENT) / MERGED WITH THE OTHER SURVIVING / SCOTTISH INFANTRY REGIMENTS TO FORM / THE ROYAL REGIMENT OF SCOTLAND. / OUR UNBROKEN HISTORY AND SERVICE TO / SOVEREIGN AND COUNTRY LIVES ON IN THE / 1ST BATTALION OF THE NEW REGIMENT. The crest of the regiment includes a roundel with G VI R in the centre. 4) . NEITHER . IS. IT . FOR . HONOURS . 6) . THE . SAKE . OF . LIBERTY . ALONE . 7) . WHICH . NO . TRUE . MAN . LOSETH . 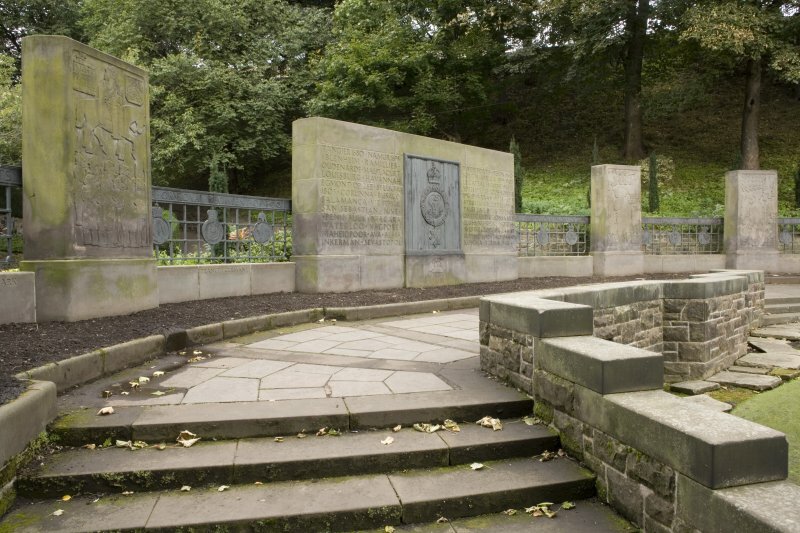 A data upgrade project to record war memorials.